" The researchers at Albion Swords Ltd. have developed this design as both an authentic and romantic commemoration of the 90th Anniversary of El Zorro®, based on extensive research on the period immediately before and during Zorro’s® heroic defense of the people of California. " I'm sorry but the Albion sword seems to be a mishmash of swords from the period, as much as Zoro was a nobleman he would not have used a sword that could be traced, ergo it would have been a quality working Spanish rapier. Yes, a basket hilt light cutting rapier. Precisely! Do you know of any decent basket hilt light cutting rapiers, I've always wanted one. Every kid who ever watched Zorro really wanted a sword just like he used. My Hanwei Solingen swept hilt rapier looks nice to me, but it just doesn't cut it, pardon the pun, it's a pure thruster. I'm fairly sure almost all the Zorro swords have just been prettied-up smallsword types, or short rapiers. Film swordsmanship (with pointy-stabbies at least) is generally closer to smallsword or foil fencing than true rapier. Even the Antonio Banderas movies, although they gave a nod to destreza (Spanish rapier style), still showed him using a smallsword. A quick look on google images using Zorro + Fairbanks produces "Search About 63,500 results (0.22 seconds)"
Almost all of them have Zorro with a fencing foil type blade. I believe that is more of a fencing sabre. But that would be kind of a major anachronism, by something like a hundred years, I think. As for the Albion sword, it's kind of overdone, but then again you don't really want to make the Commemorative Anniversary Sword of Zorro something run-of-the-mill. The point, if you will excuse the pun, wasn't to make the weapon Zorro is definitely most likely to have used but rather make a fancy and unique collector's sword as an homage to the character. "Hear me, men. For reasons of good form, I have decided that the so-called Pan will return in three days to commit the arbitrament of the sword. Smee, translate." "In three days, we're gonna have a war! A battle between good and evil to the death!" Seems like Hollywood prefered sabers while Guy Williams used an Epee. As mentioned, in that period there was a tendency to use fencing blades. Zorro is a 1919 American dime novel fiction. 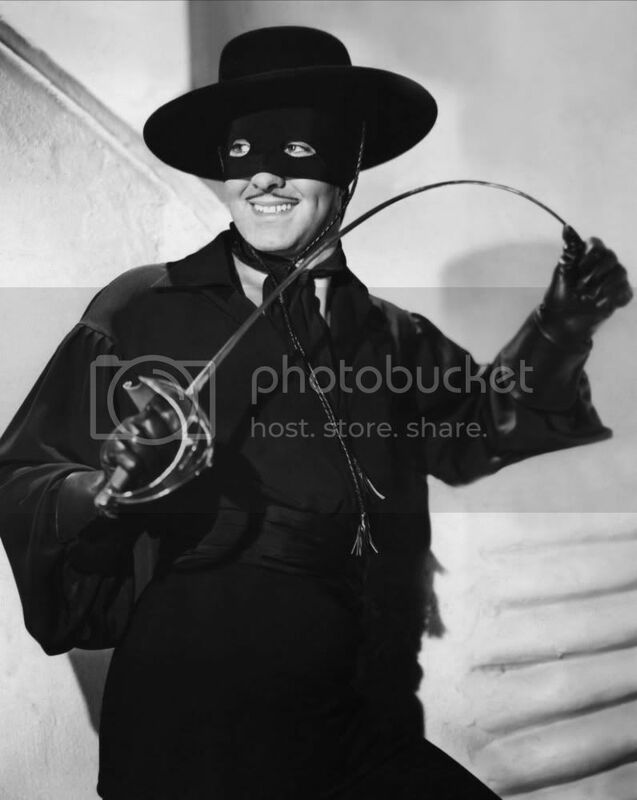 A real Zorro in California would have existed in the period 1770-1810. No rapiers then. 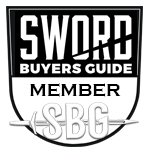 Small swords, Broad Swords, Hangers and Backswords and Sabers. Albion got it wrong, from a purley historical perspective. Thanks Dave, always a great source of knowledge! I have a 'double-wide' epee blade sharpened to a fine point mounted on an old Popinjay smallsword hilt, looks very similar to the hollywod blade (dufferent hilt obviously). Incidentally, do you know of any worthwhile light cutting rapiers from any period that are fairly affordable? Is the Windlass Musketeer Rapier (www.kultofathena.com/product.asp ... eer+Rapier) a decent blade for the money? Windlass blade would do it, but it's a heavy cup hilt. I haven't actually handled any of the Windlass simple guards. Not sure if there is enough blade. The Windlass 30 Years War Saxon only has a 33 inch blade, but it has brilliant balance and an excellent blade. My chief complaint in the review was the sub par plastic grip they slopped on (badly in my case). 'couse, that was just a good excuse for sending it to Sunny Suttles for a glorious refit. How 'bout a WEI Spadroon? Oversized for a small sword, and an able cutter with a decent edge put on the blade. Looks nice, I like it, classical smallsword, but this doesn't cut or poke, it's got an epee blade on that with a standard (blunt) button tip, no edges though. Weaponedge India. These were selling $40.00 cheaper a few months back. Of course this is Tyrone Power from the "Mark of Zorro". These do appear to be sport-like sabers, but the guard seems larger. Earlier in the film the young Diego is in Spain, training with some regiment, and he is equipped with a [heavier] saber that Dave Kelly could identify. It has a straight guard (not a basket) which he sticks in the cantina's ceiling "until he returns." Napoleonic Spain used a lot of English supplied equipment. Post War Spain went French in style from 1816-1860 then German. Honestly I mostly remember Zorro using light sabers or epees. Not sure what the Disney TV show used, but the old Family Channel show used a light fencing saber. The current Hanwei Hutton Saber probably wouldn't be far off.